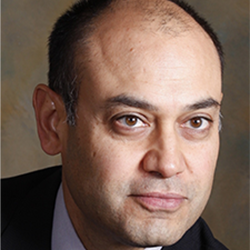 Dr. Gupta is Chief of the Division of Pediatric Neurosurgery at UCSF Benioff Children’s Hospital. His clinical and research interests are in the area of translational neuro-oncology and the treatment of rare diseases in children. His research laboratory is focused on developing models of complex disease processes, and determining how normal components of the innate immune system contribute to tumor growth and recurrence through biological processes such as immunosuppression and the creation of a favorable microenvironment. He has participated in early phase clinical trials directed towards treatment of children with diffuse intrinsic pontine gliomas (DIPG), and other rare diseases such as fetal myelomeningocele, and single gene defects.